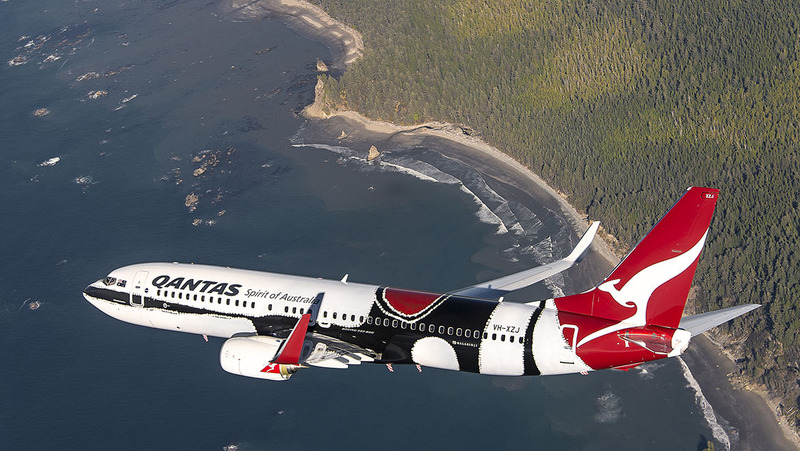 This week’s Throwback Thursday feature, from the December 2013 magazine edition of Australian Aviation, looks at the fourth aircraft in Qantas’s Flying Art series, the Boeing 737-800 Mendoowoorrji. Qantas and Boeing have unveiled the most complex painting of a plane ever undertaken to celebrate one of Australia’s most famous Indigenous artists. The livery took 10 days to complete and for the first time Boeing’s paintshop employees used brushes to re-create the textures of the late Western Australian artist Paddy Bedford. Fourth in Qantas’s flying art series the project is a partnership with Australian designers Balarinji and is an interpretation of the 2005 painting Medicine Pocket, which captures the essence of Mendoowoorrji, Bedford’s mother country in the East Kimberly of Western Australia. Mendoowoorrji, carrying the registration VH-XZJ, was handed over on November 8 at a ceremony at Boeing’s facility at Paine Field, Seattle. The blessing of the 737 was led by Kathleen Watson, Bedford’s daughter, Mona Ramsey, niece of Bedford and Shirley Purdie, prominent artist and important ceremonial singer and dancer. 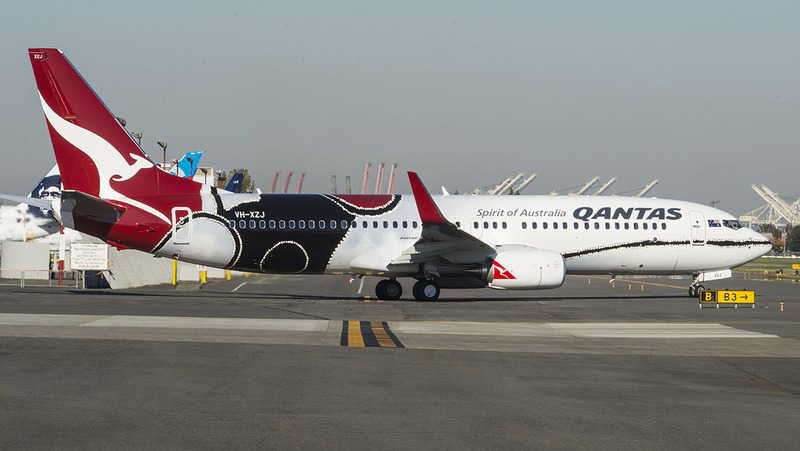 The delivery crew of the 737 led by Qantas technical pilot Captain Alex Passerini and Captain Harry Pemberton joined in the celebration complete with Indigenous markings. Newly-announced Qantas Ambassador Indigenous AFL player Adam Goodes also took part in the delivery ceremony. 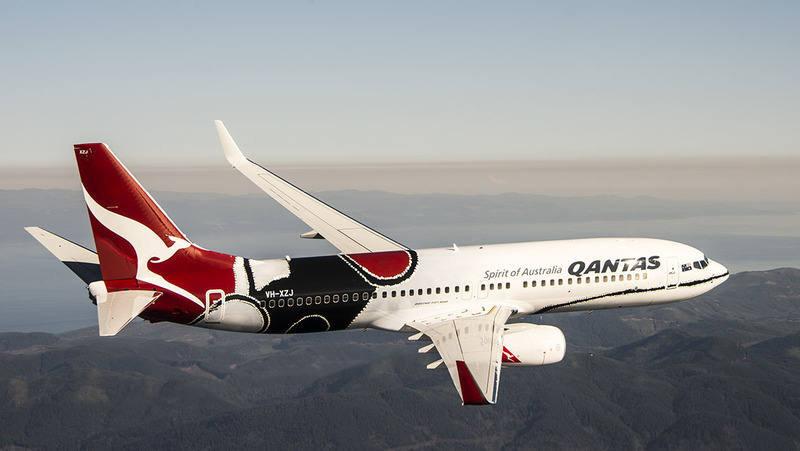 Qantas CEO Alan Joyce said that as Australia’s national carrier, the airline will fly this livery with great pride. 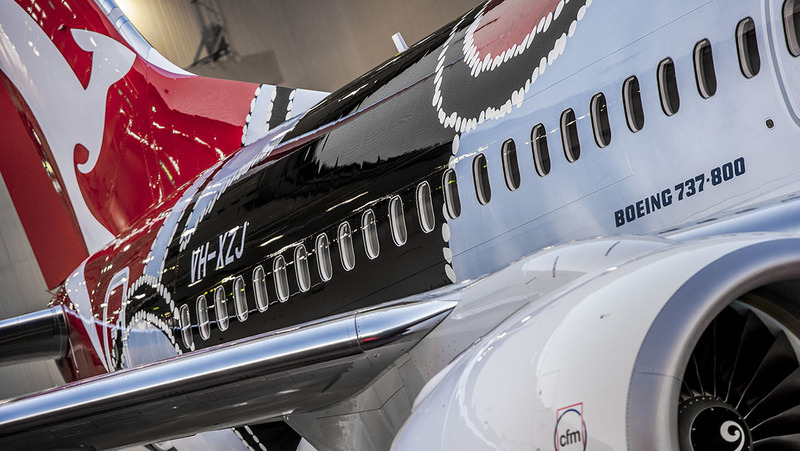 Balarinji’s managing director, Ros Moriarty, said in the studio’s 30th year, it was a privilege to again work with Qantas on an iconic Indigenous art aircraft. “We applaud Qantas for the leadership in supplier diversity and reconciliation,” Moriarty said. 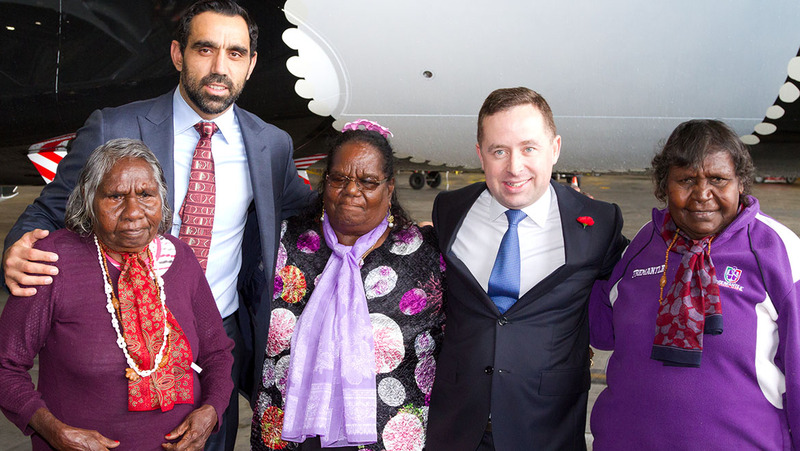 One of the four key focus areas of Qantas’s Reconciliation Action Plan (RAP) is a commitment for Qantas to support Indigenous-owned enterprises through the development of a more comprehensive supplier diversity program. Qantas is a founding member of Supply Nation. Joyce said the new 737 is an example of where companies can successfully engage minority suppliers. Paddy Bedford died in July 2007 aged 85 and was hailed as one of Australia’s coolest painters, although only 10 years into a spectacular career. He found worldwide acclaim with his innovative approach to the Turkey Creek style of plain ochre and sparse lines pioneered by artistic luminaries Rover Thomas and Queenie McKenzie. Bedford, however, did not start painting for exhibition until he was well into his 70s when a Melbourne art dealer stumbled across a collection of his discarded paintings bound for the local tip at Turkey Creek. Deeply grounded in traditional lore and ceremonial practice as a senior Gija elder of Jawalyi skin, Bedford enjoyed his rare ventures into the ‘whitefella art world’ where he was feted by curators, buyers and other admirers. However, in the city he cut a fine figure with his elegant silver-tipped cane, stockman’s hat and Armani suit he loved to wear to special occasions. Bedford’s humour and warmth was to the fore despite an upbringing that would break most. After spending his childhood at Bedford Downs, Bedford was incorrectly diagnosed with leprosy just before World War 2 and sent to the leprosorium in Derby where he met and married Emily Watson. They had one daughter, Cathy, who was taken away, along with Theresa, a second daughter from another relationship and raised in the mission at Beagle Bay. Returning to Bedford Downs in the 1950s, he worked for many years as a stockman for rations of flour, tea and tobacco until he was forced to leave in the mass evictions in the early 1970s after the introduction of legislated equal wages. He later worked for Main Roads shifting rocks on the Gibb River Road before a back injury forced him onto welfare and retirement at the Warmun Aboriginal community at Turkey Creek. It was there Bedford took up painting. A Qantas YouTube video detailing Mendoowoorrji’s delivery and arrival in Australia. Prior to painting of the aircraft in late October 2013, Balarinji, Qantas Engineering and the Boeing paintshop tested a number of previously untried techniques to transfer the difficult textural shading of the Bedford work to the plane. During the actual painting, which took place at Boeing Field, Balarinji and Qantas Engineering art-directed the Boeing paintshop crew in applying shading and textural elements by using for the first time at Boeing, brush and other hand painting techniques. The gluey consistency of plane paint and quick drying time made this exercise delicate and challenging – but ultimately the effects were successfully achieved. It took more than 950 manhours to complete the paintwork over five days. In all 500 litres of paint was used to complete the artwork along with 140 nylon stencils. To appreciate the detail you need to get close to the fuselage and then you realise that the whole aircraft is a canvas. Much of the white is in fact graduated shades with whites melding into grey and there are even hints of blue. Brush strokes are evident in many areas and even some hairs from the paint brushes can be seen under the protective gloss. Mendoowoorrji will be seen extensively around Australia and was to be showcased in Canberra and Broome late last month. 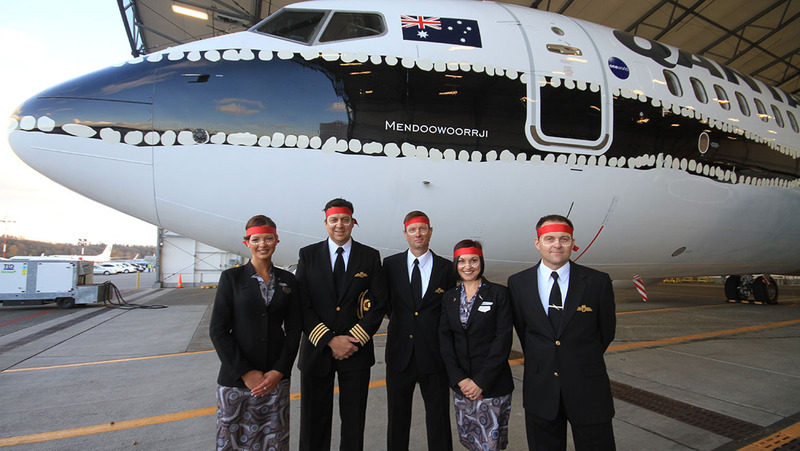 The Mendoowoorrji project was instigated to celebrate Qantas’s RAP and ongoing commitment to the Indigenous community. Qantas engaged Balarinji to source and recommend an artist in consultation with Qantas art partner the National Gallery of Australia (NGA), on whose work the Balarinji aircraft design would be based. WA was selected as the region to be featured and the NGA presented an extensive list of artists and artworks as potential options. Moriarty said Balarinji selected three works – one from each of three WA painters. The design based on Paddy Bedford’s work was chosen unanimously and became Mendoowoorrji. The Bedford work Medicine Pocket was not held in the collection of the NGA at the time, but was gifted to the NGA by the Paddy Bedford Estate and is now on display in the Indigenous Galleries. The final detail was exacting. “The Balarinji studio team also worked intensively with Boeing design consultants, Teague, to prepare renders (application files) detailing every dot, every line, every motif of the original Bedford painting and Balarinji design to ensure application would be true to the original painting,” said Moriarty. Even the iconic red tail that adorns Qantas aircraft was painted in a slightly darker, richer tone to match the earthier ochre which appears on the top of the fuselage. William Mora, representative of the estate of Paddy Bedford said “he thought it was the most wonderful interpretation of one of Paddy’s paintings onto the body of the aircraft”. This article originally appeared in the December 2013 magazine edition of Australian Aviation. To read more stories like this, subscribe here. Love the idea of aboriginal art of Qantas aircraft and I hope it continues. I have to say The Balarinji team’s deconstruction and conceptualisation of the paintings into aircraft designs (in my mind and I know many other aviation enthusiasts who have comment similarly) just doesn’t do justice to the art. Maybe time to give the job to another company to adapt the art for Qantas and come up with something far more breathtaking?